To set the scene: it’s 1974, it’s Paris, two young guys in their bed-sit (one of whom is French music maven/famous producer Jay Alanski) are dreaming of counter-culture, and their internal versions of California and New York. The result is this album, a child begotten of Marc Bolan, Baudelaire, and Lautréamont; a fascinating record, subtle and engaging as it is scarce; the re-creation of a parallel pop universe which one Michael Moorcock wouldn’t have renounced. Somehow, the duo get their record out into the world on Monde Melody’s one-off “Silk” imprint (a tribute to Marc Bolan). And what twisted songs (in English) they managed to squeeze into a fifty-minute slab of vinyl. The music drips with deep nostalgia for the decadent “beautiful people” who lived and breathed and then found a home in the songs of Lou Reed and Leonard Cohen, pervaded throughout with a kind of psychedelic sadness. All of this is expressed by means of long jagged acid guitar runs (or in acoustic strums) supported by Moroccan percussion (bongos?) and heavy bass lines from Christophe J. A post-quaalude album, as band leader Jay Alanski has said. If the LP had been released in 1971, everyone would point to T-Rex as an influence, and call it “glam folk”; fast forward to today and it’s hard not to think “loner,” and draw comparisons with the music of Devendra Banhart, albeit recorded 35 years ago! 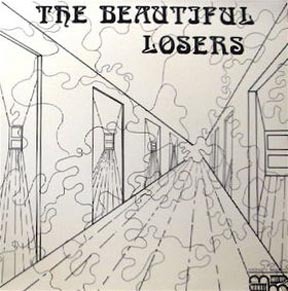 We’re now several decades further on in the world’s slow self-destruction, but this sole recording by the Beautiful Losers has lost nothing of its freshness and superb arrogance. Blessed be the listener who is going to discover such a hidden treasure!